The Good: Where do I begin? 26 three pointers almost broke the NCAA record. Peyton Aldridge, Jon Axel Gudmundsson, and Keelan Grady were unstoppable. Davidson had 29 assists to just 1 turnover. The Bad/Ugly: Literally nothing. Davidson played a flawless game. I guess one thing to keep an eye on is how two-dimensional Davidson can be against tougher teams in terms of perimeter defense. 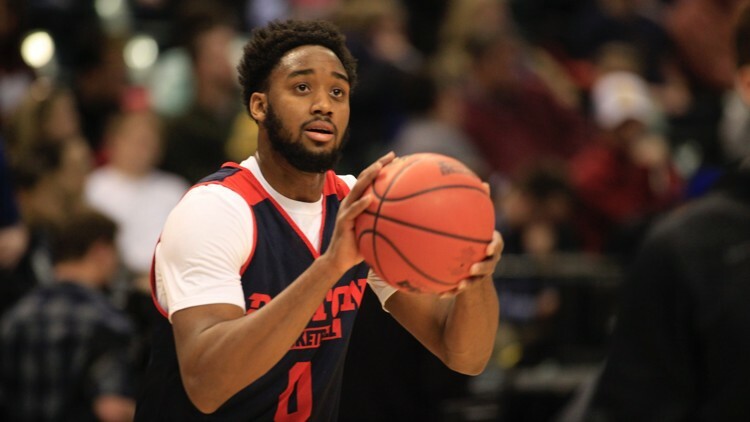 The Good: Josh Cunningham had 22 big points including the game-winning bucket in the post. He helped UD scrape out a solid win over a pretty feisty Ball St. team. The Bad/Ugly: The Flyers narrowly escaped a home loss against a team that ranks 134th according to Kenpom. Dayton also let the game be closer than it should have; the Flyers got off to a killer start. The Good: Keith Dambrot scheduled them easy for a reason, and it worked today. Duquesne got off to a 1-0 start to the season with 80 points. 3 players scored at least 17 points for the Dukes. The Good: Ummmm… they held the RedHawks under 60 points! The Bad/Ugly: 12.5% shooting from three, 7/14 from the stripe, allowing 20 offensive rebounds for the opponent, and still managing to lose despite forcing 21 turnovers and only committing 9: pick your poison. The Good: Mason gutted this one out and got incredible contributions from its starters all game long. The Patriots sealed the deal despite firing at 47.1% from the free throw line. The Bad/Ugly: No one off the bench contributed any points. The Patriots will have a serious depth problem this season unless some of these new guys can kick it up a notch off the bench. The Good: Yuta Watanabe had the kind of performance, offensively and defensively, to prove he’ll be one of the best in the league this year. 7 blocks on the defensive end is quite a stat. The Bad/Ugly: It took a little too much effort to beat a really bad team at home. Howard had a much better shooting night from distance than GW. The Good: La Salle was defensively adept on Saturday, holding the Peacocks to 27.6% shooting from the floor and forcing 17 turnovers. The Bad/Ugly: I’m not sure how much of La Salle’s good defense was just Saint Peter’s inability to get anything going, but we’re going to give the Explorers the benefit of the doubt. The Good: Well, the Minutemen didn’t drop a home game to UMass Lowell, despite expectations that they might. The Good: Rhode Island’s defense forced an incredible 27 turnovers against a team that should be one of the better mid majors in the country. Defensively, you couldn’t have asked for much better of a performance. The Bad/Ugly: Three point shooting was an issue for everyone not named Stanford Robinson, and it’s yet to be seen if Rhode Island has a guy that will be a consistent outside threat this year. The Good: The Spiders were getting blown out of the water at the half, and at least they almost made it a single digit loss. Freshman Jacob Gilyard also looked very impressive. The Bad/Ugly: There was a lot of bad in this game. For one, you can’t let a team come into your building and knock down 21-31 two point attempts. Defense needs to get a lot better. The Good: Offense was soaring, and Shavar Newkirk played well in his first game back. Freshman Taylor Funk also had a dominant game, especially from downtown. The Bad/Ugly: Free throws were a serious issue, and the Hawks could not stop the Rockets from three. Perimeter defense has to be a focal point in Martelli’s next practice. The Good: Javon Bess was a monster for this team, and it seems like he could be the guy who emerges and leads them in scoring. Aaron Hines also provided a huge spark from long range. The Bad/Ugly: SLU will hope to find a little more success from long range than it did on Friday night, but other than that, this was a good win. The Good: Matt Mobley was big, as expected, but it wasn’t enough without Jaylen Adams. The Bad/Ugly: This loss stings, and the Bonnies are going to need some big wins to pick up the slack that this L will carry. They need to get Adams back into the lineup ASAP. The Good: Defense, rebounding, and balanced scoring were all big wins for VCU on Friday night. The Bad/Ugly: The Rams committed a lot of fouls in their opener, but outside of that, this was a pretty flawless first win for Mike Rhoades at VCU.